Here we have the talented winemaking team of Fabian Valenzuela (L) and Jean Claude Berrouet (R) at Tapiz. Located in the Uco Valley in Argentina, Tapiz is best known for their Malbecs which are on restaurant lists across the US. 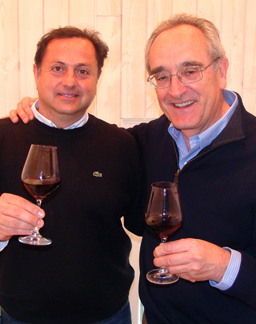 Tapiz winemaker Fabian Valenzuela was joined by Jean Claude Berrouet in 2012. Fabian is the son and grandson of vignerons and has more than 30 years of winemaking experience. Jean Claude is the recently-retired winemaker of Petrus, having presided over 44 vintages at this famed Bordeaux winery. Jean Claude was the first permanent winemaker at Petrus which was a pretty serious honor. These wines are sourced from San Pablo which has some of the highest altitude vineyards in Mendoza (4,600 feet above sea level). The high elevation here, with huge diurnal shifts, helps impart the natural acidity to the Malbecs.